Most of us do not regard the calories and nutrition (or lack there of) coming from liquids as much as that from solid food. But be assured, liquids, fruit juice in particular, do count just as much as solids towards your daily caloric quota and your overall nutrition. It’s a matter of weighing the better choice over the least desirable. Liquids other than water contribute to your fluid needs as well, and it’s not necessary to exempt them altogether, particular when they are chosen wisely and in moderation. When it comes to nutritive value, soda is definitely out of the game all together. Most sodas on the market are really ‘sugar water’ with flavorings; its an ‘energy shot’ and that’s it. At up to 150 Calories per 12 oz can, it is basically adding empty calories with no nutritional value. Soda with artificially sweeteners is even worse from a nutritional perspective, because it is practically all synthetic. So other than creating a fake image of a 'healthier low-calorie' alternative, diet soda does not deserve to take up any room in your kitchen or on your dinner table. Fruit juices offer a sensible alternative, but it's important to consider whether they are really fruit drinks or fruit cocktails with very little actual fruit. 100% fruit juice has the most value nutrition wise; and incorporating it is simply a matter of personal choice when going grocery shopping. • Is one of the first ingredients high fructose corn syrup or added sugar?- In such a case you already know you are not getting 100% fruit juice and should move to the next choice. • What is the nutritional makeup of the juice? Juice labels usually display % of Vitamin A, C, Calcium and Iron. Other nutrients may be voluntarily displayed by the manufacturer if they are applicable. Always make sure that it at least has 100% Vit C. The percentages of the other nutrients will vary depending on the type of fruit juice, the different fruits used in the juice, or whether the juice is also mixed with vegetables as with V8. Calcium fortification and the addition of pulp for added fiber are also great extras when choosing a juice. NOTE: Vitamin C improves the absorption of Iron, and so including a Vitamin C rich fruit juice drink with a meal is a good idea. If you are drinking juice you want to make it a nutritional powerhouse in your diet and the more nourishment you can get from it, the better. 3) “Juicing” is a great idea if you have the time. The best juice is always the one you make yourself, because you can control what goes in it. For example you can mix carrot with apples or mix a less acidic fruit with a citrus fruit. 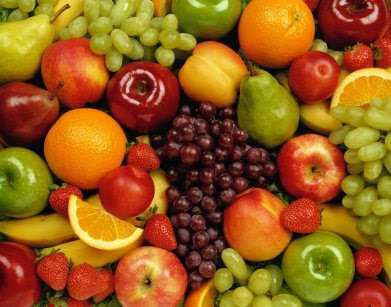 You are also gaining the benefit of preserving the fiber content of the fruit as well. 4) Organic juices have solidified their place in the beverage market, and provide a great healthful option. Even with the healthiest drink however, you should refrain from the urge to overdo it which is very easy to do with juice. After all it’s a liquid which can be gulped down your throat quickly and with little effort. So you should be mindful to drink the best, but drink sensibly. Besides contributing to surplus calories, too much beverage in the diet has been attributed with replacing milk in the diets of Americans, especially children. So a couple true 80z servings(about 120 calories/serving) a day of juice is quite adequate. When choosing soda over juice or choosing the type of juice you will consume, remember always one fundamental attribute of The Non-Dieter Mindset-QUALITY, QUALITY, QUALITY! Making it a priority to choose the 'creme de la creme' amongst your food choices, is a sure way to begin redefining your relationship with food and creating more positive food related experiences.